A hearty thank you to everyone who braved the elements last night and joined us for Cobaya Gras. A group of 36 got to eat some great food from Chefs Kurtis Jantz, Chad Galiano, Mike Marshall (a/k/a Big Basco), Jenny Rissone and Chris DeGweck. We had a great time and for the most part even managed to stay dry. I'll follow up with a recap over on Food For Thought, but in the meantime here are some pictures from last night. 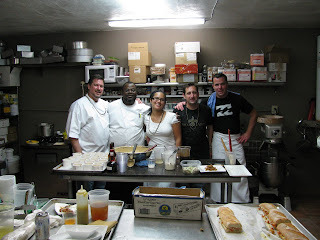 Update: Recap now up at Food For Thought, and an inside view from chef Chad Galiano. "Cobaya Gras," a celebration of Mardi Gras Cobaya-style, featuring the cooking of some New Orleans expatriates, will be happening next Friday evening 2/12. Price will be $50 a head, BYOB, style will be a little more laid back than some of our prior Cobaya dinners. If you wish to attend, PLEASE EMAIL ME DIRECTLY (the email link is over on the right, where it says "contact the underground"). WHEN YOU HAVE A CONFIRMED SEAT, please use the PayPal link below to book it. Don't pay for a seat before you've gotten confirmation that they're still available, thanks. For those who do not compulsively check their emails, I will hold 6 seats to be selected randomly on Wednesday evening. Thank you as always for your interest. Geaux Guinea Pigs!